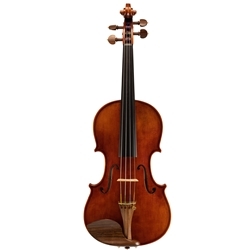 This violin shares many stylistic features with Stradivari's distinctive "Betts" violin, such as its long corners with purfling terminating in a long 'bee-sting', and the shape of its sound holes. The back is made from book matched maple, with a light, wide flame meeting in an upwards chevron. The neck is of similar maple, and the ribs are slightly more figured. The tone of this violin is very focused and refined, and is consistent across its dynamic range, making for an instrument that is a pleasure to play.